Every year the Club Chair, Jim Varnish, presents his award for ‘RIDER OF THE YEAR’. His award goes to whomever he feels has achieved the most in their cycling year. 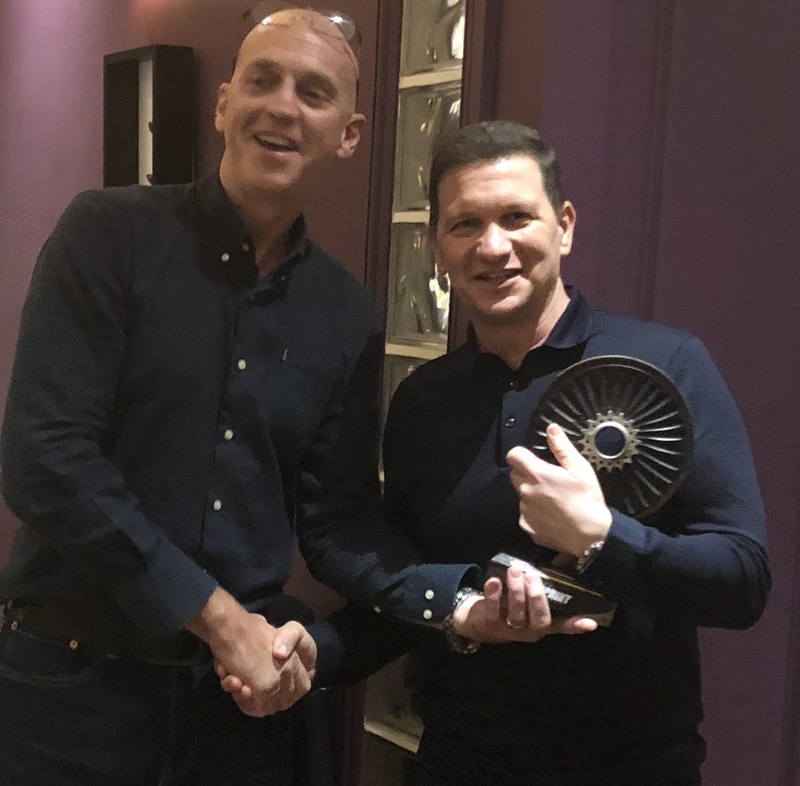 Not necessarily the faster or strongest rider, or the individual with the most race wins, but the rider who has developed or given the most to the club in the year. 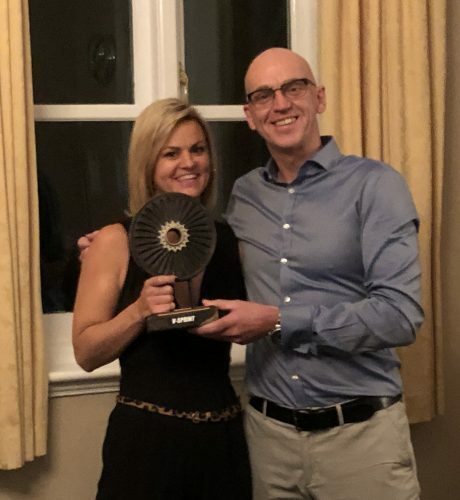 Ali continued to ride and support V-Sprint – helping to lead the Wednesday rides and ever present at the DL turbo sessions culminating in a win at this years Ladies Club Champs. You’ll also see her on the Sunday Development rides and Zwifting when not dealing with the kids and her V-Sprint partner. Congratulations to someone who wears the V-Sprint shirt with a passion. Ricky Smith, the 2017 V-Sprint Rider of the year. epitomizes much of the ethos of V-Sprint, so it is easy to understand why Ricky was a popular winner of the award. 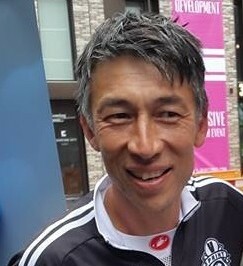 In his general riding he is an all-round nice guy, always chatty, always friendly and always there to acknowledge the achievements and help of others before that of his own. But in 2017 for Ricky it was not just about the club rides, after taking advice and encouragement from others he took up the challenge of competing, Not just representing V-Sprint, but showing that we have riders who can perform. An achievement that should not be underestimated for Ricky, having only taken up cycling 3 years ago . The name V-Sprint does not mean that sprinting is all we do. Whilst Olly is a regular rider for V-Sprint at Lee Valley Velodrome in London, he also enjoys his endurance riding, in 2016 taking part in The Transcontinental, a ride that make a 100 mile ride look like a Sunday Morning spin. The Transcontinental is one of the most extreme races in the world. 4000+ km (2485+ miles) from Geraardsbergen, Flanders in Belgium to Istanbul in Turkey. The whole race is unsupported, so there are no team cars and no fresh bikes if your bike breaks down. It’s very hard not to agree to the ‘Rider of the Year’ Award going to Olly after such an achievement. Not only is Steve one of our regular riders, he is also our mechanic. 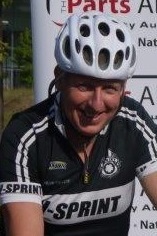 After retiring from the Police Steve retrained as a cycle mechanic and is the only mechanic some of our riders will trust. Hence his nickname ‘Spanner’. In addition Steve organises our Winter Turbo Sessions at Finstall Village Hall, making sure the venue is opened and set up ready for us to use, and then stopping behind to clear up after us. 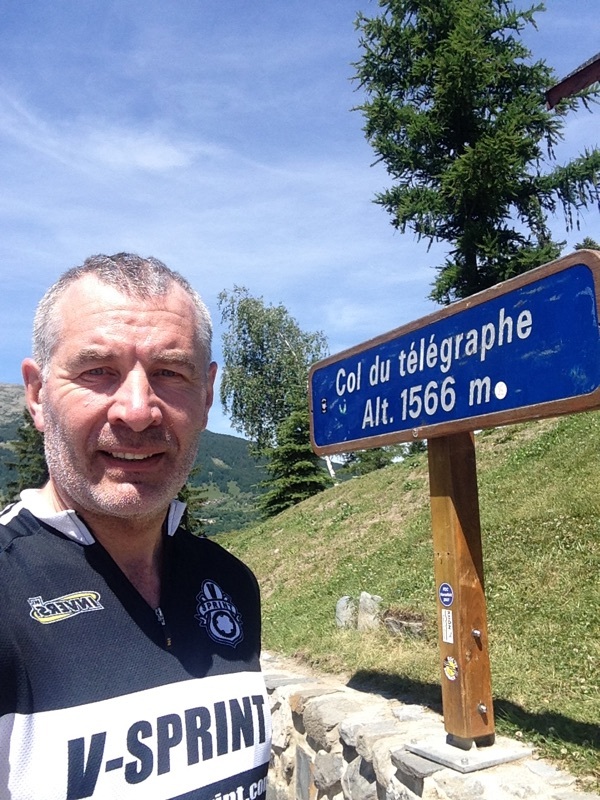 In 2015, as well as joining the team at our Mallorca training camp, Steve spent a few weeks in the Alps getting to grips with some of the famous Col’s and Tour De France mountain stages. At the beginning of 2014 Jackie road on her own lacking the speed and endurance to keep up with the bunch, by the end of the year she was leading out the ‘B’ riders on a Sunday and even joined the ‘A’ Riders on some of their rides. 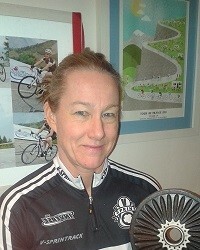 In August she completed ‘Ride London’ Sportive in a respectable 5 hours for 86 miles in a shortened event due to adverse weather conditions. Pushing the Limits in 2014, John O’Groats to Lands end in 7 days riding an average 130 miles per day. 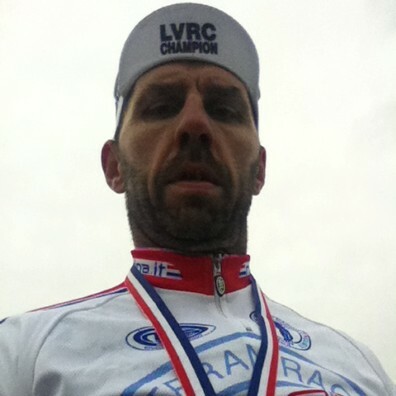 In August Andy took part in the inaugural ‘Ride London’ Sportive. Riding 100 miles in 5 hours and 20 minutes, with Jack Cracknel, Jim Varnish and Francis Longworth, Andy put in an impressive last 20 miles spending much of the time leading out the V-Sprint Train . 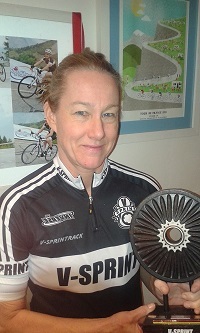 2012 LVRC Criterium Champion – Enough said! !